On your marks. Get set. Go! Once you have accepted Jesus Christ into your life as your personal Savior you have officially entered the Christian race. The prize is before you and the contest is around you and the only way to make it to the finish line is by focusing on He who paved the way ahead of you. The struggle may seem hard at times but Jesus promised, “He that shall endure unto the end, the same shall be saved,” (Matthew 24:13). Quitting is not an option and endurance is the key. We cannot give up now. He has brought us too far. We must continue in our holy pursuit of Him. 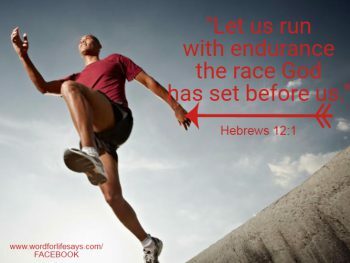 May these verses help you to reach the finish line where our only prize is found in Christ.